Jay-Z and Eminem lawsuits holding up sale of Weinstein Co. The lawsuits essentially claim that Harvey Weinstein's former company can not be sold while it still owes its partners money. The sale of Harvey Weinstein's bankrupt movie and TV company is being stymied by lawsuits from rappers Jay-Z and Eminem. The Weinstein Co., famed for producing Oscar-winning movies such as "The King's Speech" and "Shakespeare in Love," was expected to be sold to a Dallas-based company, Lantern Capital, a private equity firm specializing in acquiring midsize companies. But new claims from the two musicians, among other legal problems, are holding up the proceedings. The lawsuits essentially claim that the firm can not be sold while it still owes its partners money. The artists' separate lawsuits were filed in U.S. Bankruptcy Court in Delaware, where the Weinstein Co. filed for bankruptcy in March. A hearing was scheduled for Tuesday. 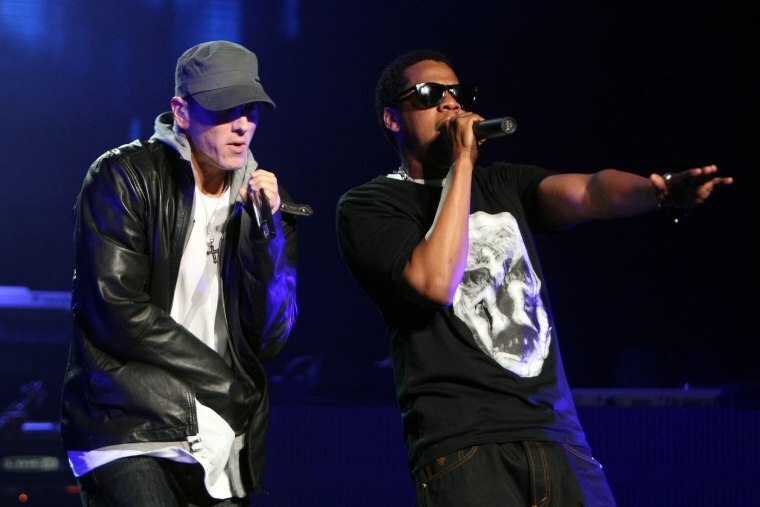 The lawsuit from Eminem, whose real name is Marshall Mathers, also involves his music label, Universal Music's Interscope Records, and suggests he is owed money for the "Southpaw" soundtrack and certain merchandising rights. The lawsuit alleges that only $48,000 in fees has been paid and that $352,000 in license fees are still owed. Weinstein doesn't have licenses to use the music and therefore can't sell them to a new owner, according to the lawsuit. Lawyers for Jay-Z, whose real name is Shawn Carter, are claiming unpaid pilot fees on two projects, one titled "Kalief Browder Project," and a second called "Trayvon Martin Project." Both are listed as assets to be sold, according to the lawsuit. The lawsuit claims that Jay-Z is owed $240,000 for each project. Weinstein is no longer employed by the once-hallowed, New York-based independent movie company that he co-founded and still bears his name, and he is also being sued by actress Ashley Judd for defamation and sexual harassment. Weinstein is fighting his former company for access to his emails in order to defend himself against a series of sexual harassment claims. Harvard law professor Alan Dershowitz is helping with that effort. The law firm representing the Weinstein Co. in its bankruptcy proceeding didn't immediately return a call and email for comment, nor did a public relations firm representing the Weinstein Co.